What a great watch! Currently learning all the functions for my next camping trip. Looks like the perfect watch for the outdoorsman. I’ll be able to lighten my pack as this watch will take the place of several different tools used in the wilderness! Triple Sensor Version 3 is the advanced CASIO original technology. Despite their smaller size, the new sensors in this model provide improved reading accuracy and energy efficiency. This new model delivers altitude, barometric pressure, and direction readings that are more accurate than previous models. A Barometric Pressure Tendency Alarm alerts the wearer to sudden changes in pressure readings, which can indicate upcoming weather events. This model is water resistant up to 200 meters and features Full Auto LED display illumination, which makes it a great choice for wet environments and nighttime operations. A stainless steel rotary bezel can be positioned to help you keep track of your current and intended bearings. In terms of both functions and looks, this Triple Sensor provides a choice of outdoor timekeeping gear that can't be beat. MULTIBAND6 reception of six time calibration signals (Japan (2), United States, Germany, England, China), Tough Solar ensures stable operation even when using power-hungry functions, Compass, Barometer, Thermometer, Altimeter, Low temperature resistant(10C/14-degreeF), Digital Compass, Time Calibration Signals/ Reception, World time,stopwatch, Countdown timer, 5 daily alarms (with 1 snooze alarm), Hourly time signal, Battery level indicator, Power Saving (display goes blank to save power when the watch is left in the dark), Full auto-calendar (to year 2099), 12/24-hour format. This watch has been more than I expected. 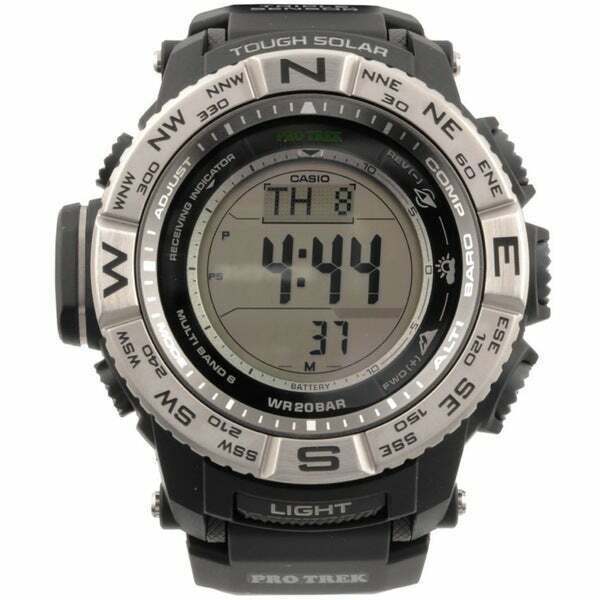 The altimeter, compass and barometer features are the best went hiking or going camping with the family. Also being water resistant to over 100 meters is a plus when your either swimming or scuba diving. My husband is a police officer and wanted a watch with specific specs to wear on the job. Nothing TOO fancy, and with TOO many options. This watch has exactly what he likes; military time, date, compass, night light and many other options that men like. The price was very reasonable. The watch arrived earlier than the ETA and in excellent condition. Very satisfied with Overstock products and shipping! I bought this as a gift for my boyfriend. He hikes and likes to know the altitude, direction, etc. There are tons of features, which is nice, but comes with a booklet of instructions...the booklet is about 1 inch thick..w very small writing..so it may take you a while to figure out how to do everything. Great looking watch! Perfect size. Love that it is solar.i will never buy another watch battery. Feature laden and accurate. I owned an older version which I purchased in the mid-nineties. This version is an far better and has no need for batteries. a little big and clunky, the altimeter is off by 200' regularly, but this is the third generation of this watch I've owned and I like it better than the Suunto that cost much much more. Directions are a bit complex but, when past that, I found that the watch was really good. Some innovative improvement would be nice such as the position of the sun and moon on the watch face. There's plenty of room. Overall rating is really good. Good looking with all the features I needed.